Why does drinking give me the munchies? Many people think that because alcohol reduces our inhibitions, we are more relaxed about what we eat. This is partly true. When you drink alcohol most drinks (mixed drinks, full octane beer and liqueurs) are filled with carbohydrates. As you take in all those carbohydrates, they are turned into sugar in your body. That sugar goes into your blood and raises your blood sugar level. This triggers your body to release more insulin, to deal with all the sugar. Doing its job, the insulin lowers your blood sugar level. When you finally stop drinking your body now realizes that your blood sugar is low from the previous release of insulin. To remedy the situation your body sends out signals/hunger pangs that tell you to eat more so your blood sugar can get back to the regular levels. Those signals are typically for high sugar and high flavor foods. Creating the perfect storm for late night nachos and peanut butter cups. Alas, this is not the whole story. A team of researchers from Sussex, UK found that Alcohol directly interferes with appetite control in your brain! It was found that after alcohol, food actually looked more appealing! Appetite is controlled in the hypothalamus. Alcohol activates this part of the brain and one of the results is craving high calorie food. The hypothalamus organizes and controls emotions, feelings and moods, as well as all motivational states including hunger, appetite and food intake. Along with the aforementioned it also has the responsibility of dealing with the concept of pleasure including satisfaction, comfort and creative activities. From a metabolism stand point, the Hypothalamus not only governs the motivation to eat, stimulating hunger and appetite, but most importantly how eating is to be experienced and reflected upon, whether it is satisfying or not, and how deep the satisfaction occurs. So how do you combat the midnight marauders? Now that you know it’s just a signal – ignore it and find the nearest bed and fall asleep. Eat a small amount of nuts or fruit to “take the edge off”. After find the nearest bed and fall asleep. If you are eating something unhealthy, eat the offending food SLOWLY to allow the signal to reach your body. This will raise your blood sugar level to an acceptable level. Then guess what? Find the nearest bed and fall asleep. Otherwise you risk running into the cycle again. Note that it’s not just drinking that creates this cycle. Sugar will do the same thing to your body at ANY hour of the day. Realizing that drinking alcohol or eating sugary sweets are an enjoyable experience for most of us the first step is awareness in why we get the munchies or uncontrollable cravings. The second step is having a plan in place to combat them so that it doesn’t turn into all out food fest. Love and hugs and congratulations! Are You A Metabolic Mess? Thank you, thank you, thank you! We have received so much wonderful feedback on the blog, the OH Detox and the products we have that are contributing to your health and wellness. You have also been great on letting us know what’s on your mind and areas that you would like to know more about. One of those areas is the effect that toxins have on our body and why they contribute to weight gain. If you are struggling to lose weight despite eating well and exercising like mad, toxins are the likely culprit interfering with your body’s metabolism. Scientists recently uncovered a surprising and disturbing fact: Environmental toxins make you fat and can cause diabetes. Inside the body, these toxins interfere with our ability to balance blood sugar and metabolize cholesterol. Because there are no drugs to treat it = no money to made by drug manufacturers. Obesity and diabetes are two of the biggest problems plaguing our Country’s health. To help solve this we need to turn our attention to the burden environmental toxins put on our bodies. Getting to know your farmer is best! If you don’t have that option “certified organic” provides you the assurance you need that the food is non-GMO, free of toxins and harmful additives. When you consume food with toxic chemicals, such as residue from the pesticides found on many fruits that do not come from an organic farm, you are consuming something that does not belong in your body. Since many of us don’t know our farmers or suppliers directly, buying organic provides us the assurance that the food that we are buying is free of the unwanted toxins, GMOs and harmful additives that we don’t want. Toxic synthetic chemicals (prescription drugs, food additives, pesticides and herbicides) are highly fat soluble therefore when the body is exposed to these substances it then creates fat tissue as a storehouse for those toxins that cannot be processed and eliminated from the body. Therefore creating more fat on our bodies. The average newborn has 287 chemicals in her umbilical cord blood, 217 of which are neurotoxic. A group of insecticides and herbicides used in the growing of food, cosmetic, and medicinal ingredients, known as Carbamates, are also used as growth promoters with penned/caged livestock production. Carbamates slow down the metabolic rate. So, the same synthetic chemicals used on our fruit and vegetables are used to fatten livestock! Carbamates are also used in medicine to promote weight gain in humans. STOP ADDING MORE TOXINS INTO YOUR LIFESTYLE! Just because your house is dirty we don’t turn it into a free for all and add more trash and dirty laundry to it because “it’s already messy”. We need to start by not adding any more trash and starting the cleaning process. 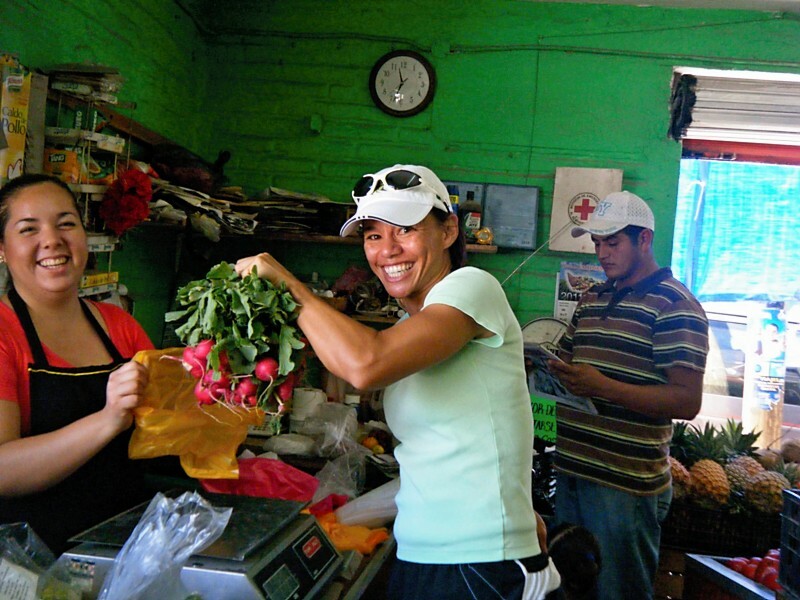 Eat organic fruits and vegetables as often as possible. 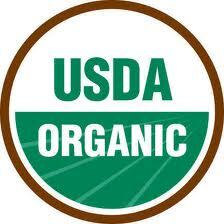 Organic foods are grown and produced without preservatives, additives, and toxins. Avoid processed foods as much as possible. Most are made with flavor enhancing additives (toxins) and have preservatives to prolong shelf life at your grocery store. Support certified organic products that hold ‘integrity’. What we mean by integrity is this. Just because you see an “organic” granola bar it doesn’t mean it’s good for you. It could be made with copious amounts of organic sugar. Yes, the sugar is organic and it’s better than High Fructose Corn Syrup (HFCS) but it’s not something that will help you lose or maintain your weight. Filter your own water and carry it with you in stainless steel bottles. Many bottled waters contain contaminants that disrupt our metabolism as well. With a diet rich in organic, chemical-free foods, losing weight is much easier. You will also feel better as these foods are processed and assimilated through your body the way nature intended. We are sooo proud of you! We have heard so many great stories on feeling great and losing weight that it’s inspiring for us as well! A special shout-out to “Adam” at the Lake for his fine job at sticking to the detox and his added benefit of noticeable weight-loss. Keep it up! We wanted to share a few more recipes with you today. 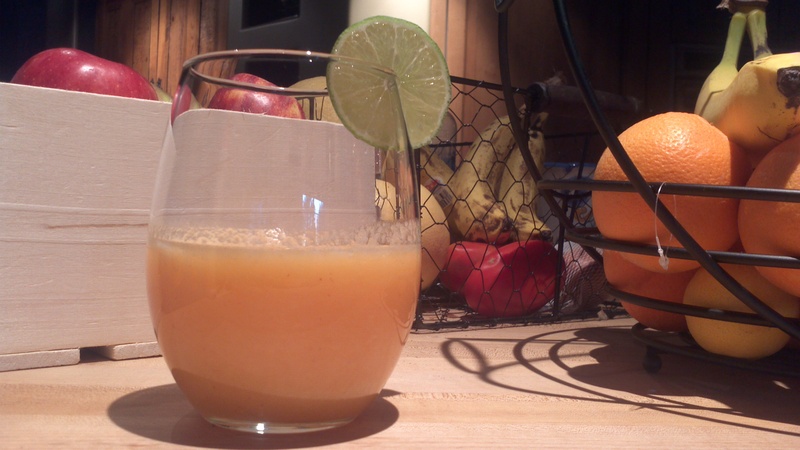 To start off the day or an afternoon snack try the Mango Sunrise Smoothie. With a little bit of coconut oil in the mix it will help keep you satiated without weighing you down. For lunch or dinner try our Easy Asian Salad. Optional: Add 1 cup of thinly sliced cooked chicken, shrimp or *baked tofu. Whisk the tamari and avocado oil together. Drizzle dressing over the tofu season with coarse salt and pepper and marinate for 20 minutes. Arrange tofu on an oiled sheet and bake for 15 minutes. Flip pieces over and bake for another 20 minutes. Let cool before cutting. Tofu can be kept refrigerated for 3-4 days after baking for an easy “add-in” for recipes. Blend first five ingredients together in a bowl and then add scallions, carrots, kale and protein. Let everything marinate together for 30 minutes and enjoy! Enjoy the day and keep up the great work! Only 19 days to go! Thank you again for all of your support and interest in Organic Housewives. We have received a bunch of questions but there were two that stood out with regard to the OH Detox and wanted to answer them here because they are great questions and probably affect many you. Q. How come I am allowed to eat other grains besides wheat? A. Because this is a detox to not only help rid your body of toxins but by making these MAJOR changes in eliminating sugar, dairy, wheat and alcohol for 4 weeks you will make lasting dietary changes that will help you forever. Because wheat is so prevalent and is the grain that primarily contains gluten (a topic for another time. :)) it is imperative that you eliminate it from your diet. Other organic grains (which are Non-GMO) such as oats and corn are better for you. This one month program is intended to help reduce the toxic load you are currently putting on your body and at the same time rid your body of existing toxins already stored in your body. This is a first phase program designed to help you transition from a typical American diet to a more natural and organic one. Although there are more diet specific or stringent detoxification programs available. We have found this to be a very effective at helping people transition into a cleaner way of eating and creating lasting habits. A. It will vary. The average has been 8% of body weight. This 8% number was also based on the other parameters of the detox. Avoiding all processed foods, walking the recommended 30-60 minutes daily and staying within the caloric guidelines of 2,500 or less per day. Note: If you eliminate all grains, walk the full 60 minutes per day, avoid processed foods and snacks and eat fresh organic foods you will see better results. 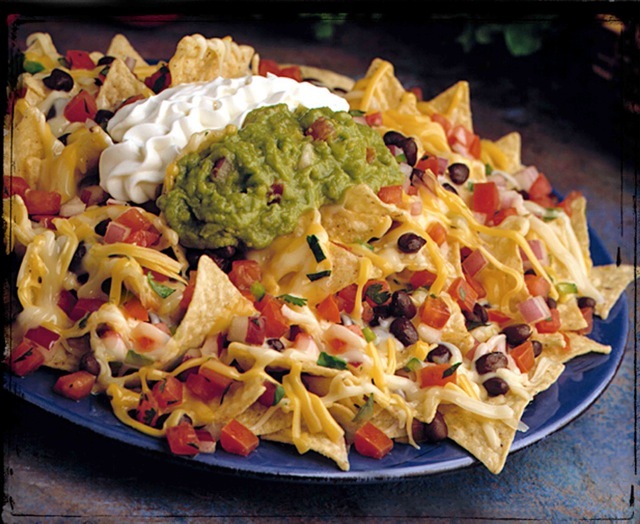 If you are curious about what makes you fat read the blog What Makes You Fat. Or read the info-graphic below. Again dear friends and family. Our health is a serious topic that quite frankly a single blog or post isn’t going to be able to tackle. We know that the topic is huge and we do our best to break down mountains of information into bite-sized pieces that will allow for true change in your diets which in turn result in better health. We firmly believe that our bodies have the incredible power to heal itself when given the proper nourishment and encouragement to do so. Please continue to email us with questions or post comments whether you have a successful moment or minor setback. We love you, care about you and can’t wait to hear about the “new” more energized you! Don’t Put Yourself In A Compromising Position! Thank you for the great response to setting goals for the new year. We received dozens of commitments to do The OH Detox to a “T” and specific self-improvement goals as well. From Lake Oconee all the way to Phoenix and several stops in between you have made a commitment and we are so excited for you! However we know it’s easy to find yourself in a compromising position if you aren’t prepared to overcome the challenges of a growling tummy or cries of “I’m hungry” from your kids! We have heard from many of you “when you give up sugar, dairy, wheat and alcohol… what do you eat?”. We thought we would give you a few suggestions and recipes to get you started. As a side note the recipes listed below not only qualify for The OH Detox but would also be considered Vegan and Gluten-Free! The great part of the recipes below is that everything can be made ahead and either shaken, stored or heated at the moment needed! We will keep adding to the blog so stay tuned for more recipes and ideas! Ringing in some green for the new year! Place all ingredients into Vitamixer. Start blending on 1 and work your way up to 8. Blend completely for 30 seconds. If you want your smoothie to be thicker feel free to add a few ice cubes. For a healthy snack have you considered popping some organic coconut oil popcorn? It’s easy, delicious and it makes a bunch! Popping with coconut oil gives you many health benefits along with that “buttery” movie theater flavor! Add several dashes of Himalayan pink salt and we’re talking money! Enough for tonight and kid’s snacks tomorrow! Take a large (8 quart pot or larger) pot and place over medium-high heat. Get pot hot first then add coconut oil. After 1 minute add the popcorn kernels and cover pot with lid. Stay alert and give the pot a shake every minute or so that the popcorn doesn’t burn. When you hear a 2-3 second gap between pops you are done! Pour popped corn into a large bowl and salt immediately. *Recipe can be halved but we like to make the LARGE batch to store for car, soccer and tweener snacks! Store in an airtight container and it will keep for a few days. 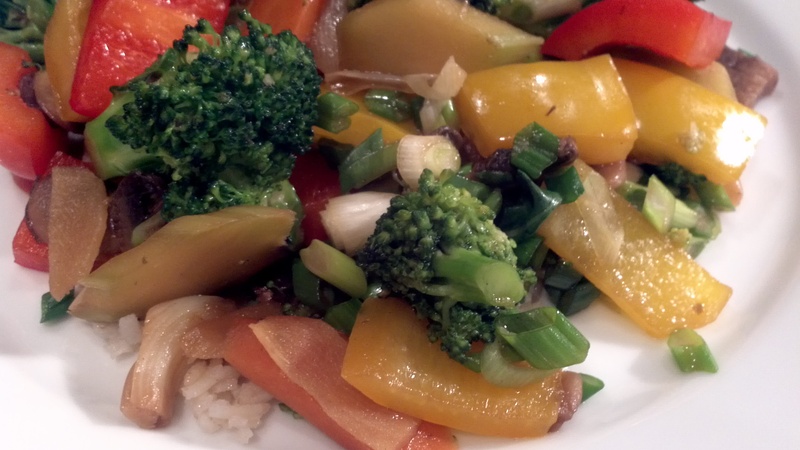 This is a veggie stir fry that cooks up fast. If you want to make it super easy you can find most of these ingredients already pre-cut at your local market. Again organic and fresh are best but if it’s not available don’t worry. Compared to the ingredients you would find at your local restaurant, you are still way ahead of the game. You can even find pre-cooked brown rice at Trader Joe’s for an ultra easy night in! In a large bowl, blend cornstarch, garlic, 1 teaspoon ginger, and 2 tablespoons coconut oil until cornstarch is dissolved. Mix in broccoli, snow peas, carrots, red and yellow pepper, and mushrooms tossing to lightly coat. Stir in tamari sauce and water. Mix in onion, salt to taste, and remaining 1 teaspoon ginger. Cook until vegetables are tender but still crisp. * You can toss pre-cooked chicken breast or tofu with this for a complete meal! We will usually make a little extra and it makes for a great lunch the next day! Keep up the good work dear ones. We are only 28 days away!